Welcome to the 12 Hours of Sebring, the one place where you wish you'd dressed up as a cow and where all kinds of marvelous wonders await you on track. Oh, and supposedly I have to lick a car. Tudor United SportsCar is the flagship twelve-hour event, but we've got the usual Continental Tire SportsCar Challenge and IMSA Lites support series in addition to MX-5 Cup, Historic Sportscar Racing, and Porsche GT3 Cup USA. While GT3 Cup is probably my favorite support series of all time (of all time! ), HSR is going to be a must-see, too. Not only can you see the sweet commemorative livery BMW added to the Team RLL Z4s for the 40th anniversary of their first American win here, but you can see the Batmobile's daddy (a '73 CSL in the same BMW Motorsport stripes) run in Historics, among all kinds of other cool stuff. HSR seems to be a "bring cool stuff" vintage series as opposed to one that adheres to a certain time period, and the entry list alone is beyond fantastic. Expect some fawning over old cars in addition to all the new, shiny toys here at Sebring. As for all things new and wonderful in TUSC, you'll see many of the same teams you saw at the Rolex 24 at Daytona. 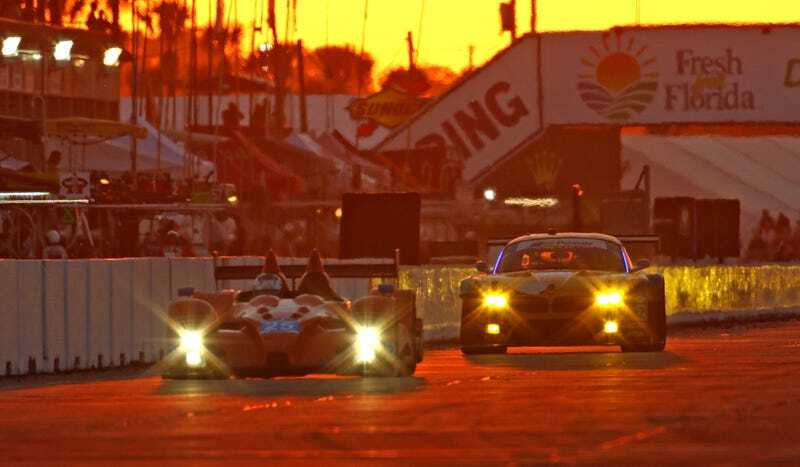 Sebring is another "big one" on United SportsCar's schedule, earning it a place in the North American Endurance Cup. Unfortunately, the pretty new Honda ARC-04b P2-class prototype run by Extreme Speed Motorsports won't be making an appearance at Sebring. Per Autosport, ESM decided that the new car needs further development before they can homologate it for their World Endurance Championship run, so they bought two Ligier JSP2s for WEC duty this year and have opted to bring last year's car (the Honda ARX-03b) to Sebring instead. The ARX-03b is an open top design rather than the ARC-04b's closed-top one, so we get to see Extreme Speed's drivers' helmets bouncing around in that car. Hooray for bobbleheads! Flying Lizard Motorsports is taking a one-race-at-a-time approach to announcing their TUSC schedule, and will run their number 45 Audi R8 LMS at Sebring after all. Marco Holzer returns to the team after a while away. Robert Thorne will spend a second weekend this month driving for the Flying Lizard team after driving their McLaren 650S GT3 earlier this month in Pirelli World Challenge. Thompson has a lot of experience in 911s, having recently moved up from the GT3 Cup series, so it will be interesting to see what he can do in the Audi R8 LMS. Part of what makes Sebring special isn't just the action on track, or the bigger story lines of the season. It's the massive party that happens around this race. You see, the 24 Hours of LeMons isn't the only endurance race that compels people to don fun costumes and be as over-the-top as possible. The Sebring Cows have been a tradition for over twenty years, partying in cow costumes all weekend. Many other groups of campers make Sebring a yearly tradition, marking their campsites with elaborate signs, including one larger-than-life plywood car I spotted this evening. FlatSixes.com talks to the Sebring Cows on their 20th anniversary and gets the udder truth. The gauntlet has been thrown: Bradley C. Brownell from Flat Sixes has nominated a Porsche 911 that must be licked. I must provide detailed tasting notes for the betterment of Porsche-kind. I'm noticing a theme with these odd endurance race weekend requests: it always seems to involve Magnus Racing. That's okay, because we like those guys, but I'm definitely noticing a theme here. Of course, I will be roaming the grounds looking for interesting stories, crazy parties and sweet cars that Bunny needs to sit on. We've already got a live Q&A set for tomorrow at 3:00 PM EDT with driver Bryan Sellers from the brilliant Falken Porsche 911 RSR team. Who knows what else we'll get into? If for some reason Fox fails us again, IMSA.tv usually streams something for the entirety of the race. They usually at least have an onboard running during the chunks where Fox Sports takes over the main feed. They put all the support series that they sanction online as well, so if you can't stand the fact that you are physically away from GT3 Cup or CTSCC, they can help with that. So, if you see someone at Sebring walking around with a pastel-hued bunny (there are multiples this weekend), don't hesitate to say hi. Know of any must-see campsites? Know any drivers who need their nails done in "When Life Gives You Lemons" chartreuse? (I brought this with me for some odd reason.) Drop us a line in the comments below.